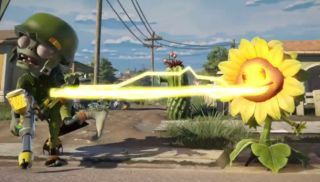 We may not be sure if Plants vs. Zombies 2 is coming to PC, but we do know that PopCap has just announced Plants vs. Zombies: Garden Warfare for the PC, Xbox One and Xbox 360. PopCap is mixing things up by making a game that combines tower defense and third person shooters. Don't worry—the characters you know and love from Plants vs. Zombies are coming back. The Peashooter, Cactus, Sunflower and Chomper were all featured in some live gameplay during EA's E3 press conference with other landmarks making appearances as placeable turrets or items. Four player co-op is the name of the game with players working together to defend against the same zombies you destroyed in the original. PopCap's trademark charm is written all over the game with Call of Duty references featured prominently in the trailer and in the name of the game—Garden Warfare. Unfortunately, Garden Warfare will be "coming exclusively first" to the Xbox One and Xbox 360 which means that it'll be a while before it makes it to the PC. Check out the rest of our E3 coverage here .